The General ST250 LP is a SmartWay Certified low platform commercial trailer tire for long haul, regional haul, on and off-highway use. Unique grooves in the General ST250 LP Commercial Trailer tire provide for superior water evacuation for enhanced wet traction and stopping power. Stone ejectors protect the casing of the General ST250 LP from drilling damage that occur as a result of stone retention. 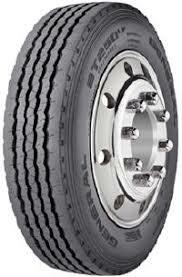 For the General ST250 LP commercial trailer tire, call or order from our online tire store today. General Tire has been producing tires for more than 100 years. They accomplish this by being a leader who innovates by introducing technology and styles that meet the ever changing needs of their customers. Started in 1915 the General Tire Company has been producing tires for all types and brands of vehicles. General Tire sells tires for passenger, light truck, truck, bus, off road through a variety of different channels. Since 1987 General Tire has been a member of the Continental Tire Company family of tire manufacturers. Continental Tire is the tire manufacturing division of Continental AG. Continental Tire designs and manufacturers innovative products for trucks, buses, industrial vehicles, cars, light trucks and vans. Continental Tire has a goal of producing products and services that are safe, economical, and ecologically efficient. With 22 manufacturing and research and development facilities throughout the world, Continental Tire is a leader in the tire industry. Continental continuous investment in research and development make it a leader in tire innovation and manufacturing. Continental Tire is one of the largest manufacturers of truck, bus and industrial tires in the world.